LOTL The Zone Welcomes ALEZZANDRA. Debuts new EP "The Black Rose "
As a songwriter and artists, it has been crucial for her to express herself fully and accurately. Her concept of “The black rose” was to create an extremely memorable experience for the viewer both visually and musically. She only worked with the people that could relate to her the best. The EP’s recording process began in downtown Los Angeles with Nathaniel Eras who helped her co-produce the album at Chrome Space, amidst a hotbed of creatives. The theme of a black rose is multi-layered. Black roses hail from fairy tales, as their improbable and "unnatural" color inspire a powerful feeling of mystical expectation. In additional, they symbolize the unexpected return of a lost love one. Though black is the color associated with death, it does not always mean mourning, it can also be the beginning of new things and a journey into unexplored territory. Throughout the EP’s creation, Alezzandra experienced a great catharsis and introspective journey. The Black Rose is about a woman who faced doubt from her peers but pushed through nonetheless. As an adult and throughout her journey creating the black rose, she learned how to conquer the obstacles of self-doubt, self-judgement and fear of failing and bloomed into a woman she fought to become. She allows her audience into her deepest thoughts and feelings through provocative art and her open discussion about the man she deeply loved and how he made everything about her so clear. He was the only one who could see who she really was and who inspired her with his words to transform. The EP is a tragic love story about the pain of loving somebody more than yourself, hating yourself and feeling disconnected to your truth and lack of self power. 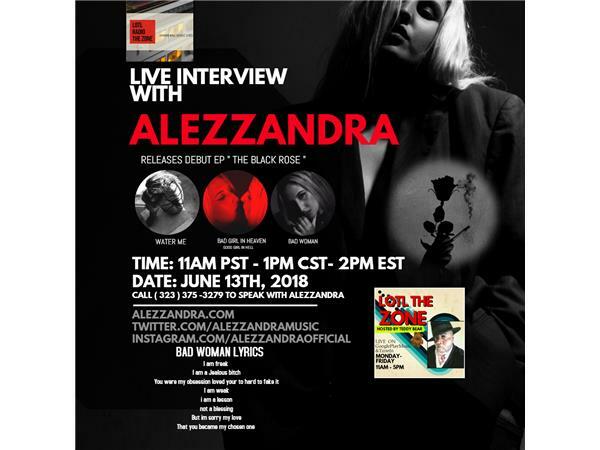 Alezzandra has exposed her deepest secrets and darkest fantasies through provocative images, lyrics and sultry vibes in The Black Rose.